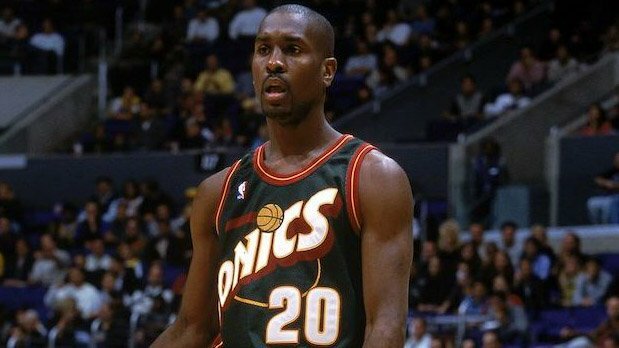 Former Seattle Super Sonic Gary Payton’s one-time Bellevue home is for sale. When I saw this it piqued my interest because my husband grew up in that part of Bellevue, and he knew Gary lived there when he was playing for the Seattle SuperSonics, but we never realized there was such an epic mansion in the Bellevue’s hilly Somerset neighborhood. Gary Payton owned this home from 1997 to 2004 (link below). His years with the SuperSonics were 1990-2003. When Gary bought the home in ’97 it was listed for $2,200,000 and it was listed for $3,189,000 when he solid it in ’04 – not a bad profit Gary! How about the price now? The hot Seattle housing market we’ve seen over the last 14 years has made no exception for this Bellevue mansion as it’s currently listed at $6,688,000 ever since it hit the market on August 7th. Looking at the stunning photos of this home (link to photos below) we see that the current owners of the last decade have invested a lot in keeping up and improving this sprawling Bellevue estate. Per the NWMLS this home sits on 3.1 acres and features 4 upstairs bedrooms, 3 downstairs bedrooms, 4 upstairs bathrooms, 4 downstairs bathrooms. Much of this home is covered in brick with a beautiful courtyard and a 4 car garage next to the two-story entry. The home is fully fenced and gated, has a pool with hot tub, and a sport court with basketball hoop (of course!). The inside is beautifully appointed with high end materials – I get a feeling most of the inside has seen renovations. View photos of Gary Payton’s former home here. The past and current owners surely have appreciated all the features of the Somerset neighborhood where the home resides, plus it is just minutes from downtown Bellevue. Bellevue is French for beautiful view so some of the residents like to think Somerset Hill inspired the name for Bellevue way back in 1869 when the city was settled. The views are so amazing in this neighborhood that you shouldn’t be surprised to see people up and down Somerset Boulevard watching the Blue Angels or a fireworks display from the distance. On the top of the hill you have a nearly 360 degree view of downtown Seattle and Bellevue plus the natural beauty of Lake Washington, Lake Union, Mount Rainier, and the Olympics in the distance. The hill top out at about 1,000 feet so during the winter if Seattle or Bellevue get a coating of wet snow, Somerset can turn into a winter wonderland once you’re about half way up the hill. I remember Gary’s house because one of my friends lived on a street above him and looking down from his back deck you could see the letters “GP” and numbers “20” painted on his sport court. 20 was the number Gary wore on his Jersey when he was playing with the Sonics. For some reason when I was a teen I knew he lived there but I mistakenly [until now] thought that he had moved away when I lived there. It was the era of MTV’s Cribs and he had become really famous so I guess I assumed he was in a mega mansion somewhere… because I never knew there was a 3+ acre parcel near the bottom of Somerset Hill. When looking down from that same friends view even though you could see the sport court, all you can really see is a sea of roofs and trees so it is deceiving that there is such a huge lot there. So cool! Whoever moves in will have a treasure of a retreat in Bellevue to enjoy. It’s a lovely location where you get sweeping views, amazing schools, and easy access to I90/405 with downtown Seattle only 10-15 minutes away without traffic.